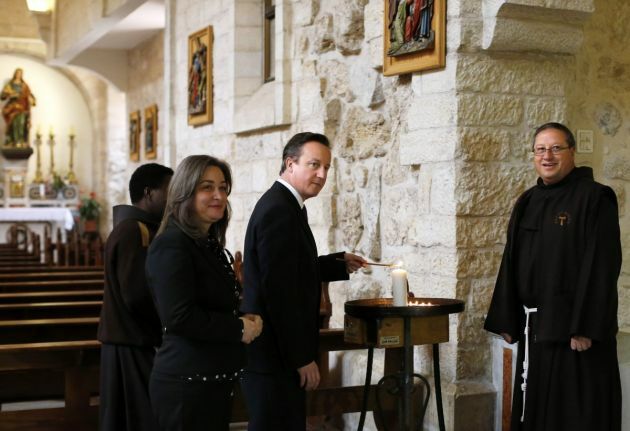 British Prime Minister David Cameron (C) lights a candle as he visits the Church of the Nativity in the West Bank town of Bethlehem March 13, 2014. Cameron is on a two-day visit in the region. He held separate talks with Israeli Prime Minister Benjamin Netanyahu and Abbas, who are at odds over U.S. proposals to keep peace talks going beyond an April target date for an agreement. Church of England bishops have publicised a private letter they sent to British Prime Minister David Cameron accusing him of ignoring their offers to help to provide housing, foster care and support for up to 50,000 refugees. Research and analysis: How to deal with refugees' plight in Europe? "It is a command in Judaism to 'welcome and love the stranger as you would yourself because you were strangers in the land of Egypt.' Followers of Islam are obliged to provide food, shelter and safety to the traveller. Christ himself and his family were refugees at one point," says the letter. Cameron himself has often been touted as a prime minister who esteems Christian values. The Guardian online newspaper described it as an extraordinary row between the Church of England and the prime minister. The 84 bishops released to the Observer newspaper the private letter they sent to the prime minister in early September. In it they called on him to increase the number of refugees that the UK is prepared to take over the next five years from 20,000 to 50,000, and to consider involving the church in a national effort to "mobilise the nation as in times past." They described the mass movement of refugees as a "moral crisis," and offered to rally "churches, congregations and individuals" across the country behind efforts to make rental properties and spare housing available to those who had fled their homelands. They also told Cameron they would "promote and support foster caring" across the Church of England and the wider community, so that thousands of unaccompanied children who had become homeless could find places to live and appropriate care. "We are reminded that in the crypt of Canterbury cathedral there is a 17th-century notice which pays tribute to 'the large and liberal spirit of the English church and the glorious asylum which England has in all times given to foreigners flying for refuge against oppression and tyranny,'" write the bishops. The Guaridan quoted church sources saying the bishops' letter was written in September with regret rather than in anger. In recent weeks, however, frustration grew at the slow pace of the UK government's resettlement programme. Last week Richard Harrington, the minister with responsibility for refugees, declined to say how many had been brought to the UK, telling lawmakers, "I don't think anything will be helped by my giving a running commentary on numbers." The newspaper said bishops were also dismayed by the belligerent tone of a speech by the minister in charge of the home ministry, Theresa May, to the Conservative Party yearly conference earlier this month. May said in her speech refugees should not be "conflated" with economic migrants. The "desire for a better life is perfectly understandable" she said, but "there is a limit to the amount of immigration any country can and should take." She said, controls are needed, "because when immigration is too high, when the pace of change is too fast, it's impossible to build a cohesive society. It's difficult for schools and hospitals and core infrastructure like housing and transport to cope."